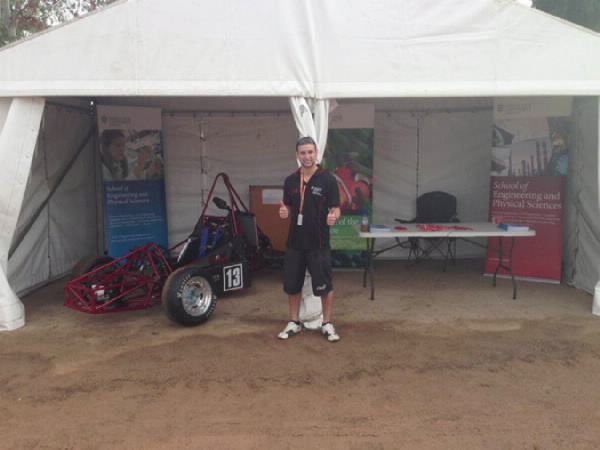 JCU Tec-NQ Racing (JTR) successfully competed at the FSAE-A competition in Melbourne for 2015. The students put in a huge effort to get the car built and represented JTR with distinction. The primary goal for 2015 was to pass all technical inspection areas and drive the car and this goal was far surpassed. On the Friday of comp the team competed in all the static events (design, cost and business presentations) and the students performed admirably. On Saturday JTR passed all three components of technical inspection and were able to drive at comp for the first time. 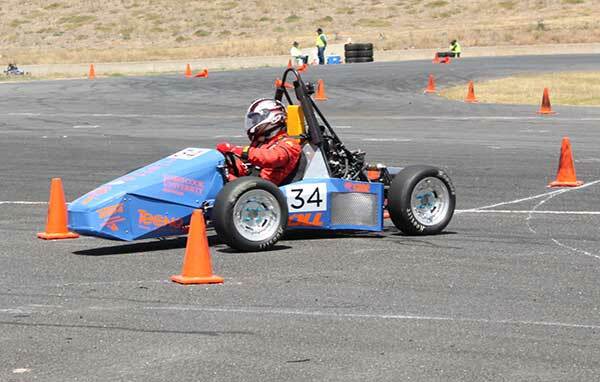 3rd year student and team technical manager Jordain Fegatilli completed two acceleration / break tests as the last part of the technical scrutineering, and then completed 2 attempts of the autocross event. On Sunday, Jordain and first year student Billy-Ray Rittson completed our first ever endurance event (7 autocross laps each with a driver change in the middle). That event is the hardest on the cars and measures engineering resilience, speed and fuel efficiency. Many cars don’t complete a heat and it was a huge success for the team to finish. The success of the event puts the team in an excellent position to design and build a truly competitive entry for 2016 utilising all the knowledge gained. 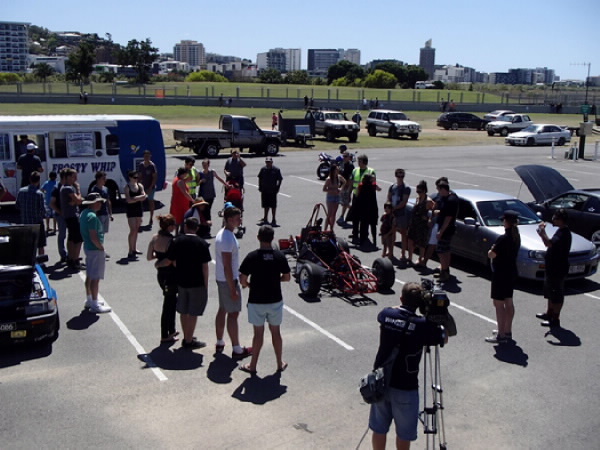 Following the completion of JCU Motorsports' first FSAE-A Event in 2014, the team has embarked on an exciting new adventure by merging forces with the Tec-NQ technical college in Townsville. Tec-NQ comprises some full time apprentices and also year 11 and 12 students completing high school who concurrently complete the first 2 years of a trades apprenticeship. By joining forces, JTR brings engineering students and trades students (fitters, fabricators and automotive mechanics) together with the common goal of designing and building a race car. The relationship represents a significantly improved level of team sustainability going forward and is poised to have huge benefits for both the engineering and trades students. Engineers and trades work closely together and it is intended that this relationship can be build right from the beginning of their training through this collaboration. 2015 is poised to be a good year for the JTR team. 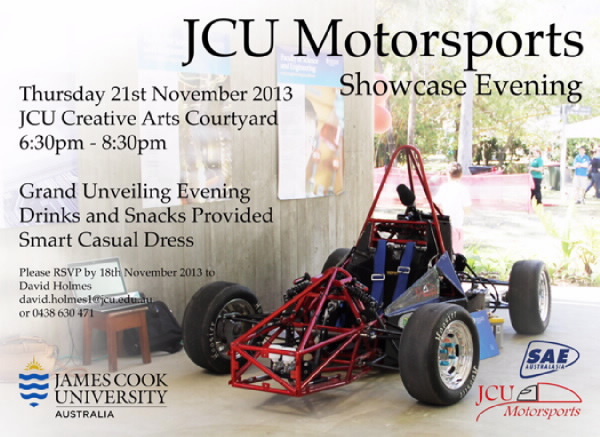 As the official unveiling of the complete JCU Motorsports car for 2014 competition, the team is holding a showcase evening to display the car and share our journey with the public and industry from around the region. All are welcome to come and see the car drive. Check out JCU Motorsports turning heads at this year’s JapNQ event in Townsville! Thanks to the organisers for hooking us up. Make sure you get down there next year to the North's own annual all-Japanese car and bike show day! The James Cook University open day for 2013 saw JCU Motorsports once again displaying the car as a major draw card for the Engineering display. The car drew significant interest from future university students interested in a career in engineering. James Cook University mechanical engineering students will display their talents this weekend with a car that has been completely designed, built and raced by students. 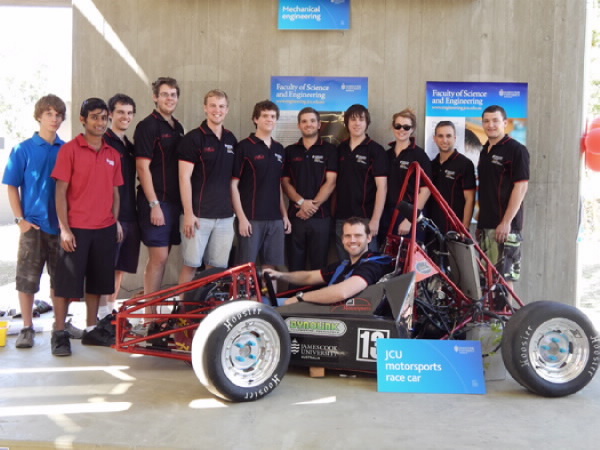 The JCU Motorsports group has been donated a stall at the Townsville400 V8 Supercar event to showcase their Formula One-style, open wheeled race car, which will eventually compete in an international competition against other universities. Open-wheeled cars are single-seated, with wheels outside of the main body of the vehicle. Mr Chris Dykstra, team manager of JCU’s Formula Society of Automotive Engineers (FSAE) team, said the car was designed by JCU engineering students in their spare time and as part of the third-year subject 'Mechanical Design'. Mr Dykstra said the design was primarily completed during the last three years, under the supervision of JCU’s Dr David Holmes. “We hope to attract sponsorship at the event to get us to competition in 2014,” he said. JCU’s SAE, which has about 15 members, including three females, was initially formed about eight years ago, but work has only seriously started in the last four years. Mr Dykstra said the team was aiming for national competition at the end of 2014 in the Melbourne-based Formula SAE-Australasia competition. Mr Dykstra said most team members were mechanical engineers but they also had electrical engineers and some business students. “All disciplines, years and courses are welcome to join the team and we certainly encourage anyone who is interested to contact us”. The SAE team will be available and working on the car in the JCU Mechanical Engineering workshop “every waking hour” between now and tomorrow. The best pictures may be tomorrow (July 5) at the V8 event as all team members will be in uniform and the car will be in its most complete state. Townsville’s James Cook University Engineering Motorsport team is looking to compete in the Formula SAE competition in Melbourne next year. The JCU Motorsports team, supervised by Christopher Dykstra, have spent the past three years designing and building their Generation One Race car, ‘Omega’. The club is hoping to gain sponsorship in the coming months to help with their goal. People who wish to follow their journey to the Formula SAE competition or sponsor the team can follow them on Facebook: http://www.facebook.com/JcuMotorsports.